Joshua D Jones Can Christian Men and Women be Friends? This paperback edition is out of print - but the Kindle version is still available. 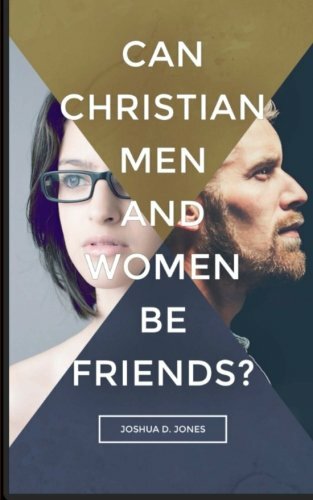 The new paperback edition is entitled 'Forbidden Friendships: retaking the Biblical gift of male-female friendship'. Contrary to what others have said, having close friends of the opposite gender is healthy, Biblical and important for spiritual growth. Deceived by 'integrity' we have let divisions creep into the Church. In many churches, meaningful friendships between men and women are impossible. Certain teachers and ideologies have put up a wall between the genders in order to avoid embarrassing sexual scandal and to ‘maintain integrity’. But this method of holiness via gender segregation is not working. Instead of a local congregation being the Family of God we now are a collection of tightly defined ‘married couples with children of God’. Instead of reducing sexual immorality, these man made rules are adding fuel to the fire. Where are the brother-sister, mother-son, father-daughter relationships that mark the type of community we see in the New Testament? In this book Joshua D Jones takes on one of the most controversial issues in the Church today. The world of male-female friendships can be tricky. Many in the wider culture believe pure friendship is impossible. There are certainly many hurt people which testify to the fact that there are real obstacles to quality male-female friendships. How does Christian theology address this issue? The Gospel proclaims that through the cross of Jesus there is real reconciliation between men and women. Not only are we to be friends, we are to be more than friends. We are to be a family. In this book, Jones takes aim at the “holiness-through-gender-segregation” method which has emerged in the Western Evangelical Church in recent decades. He argues from Scripture, theology and Church History that it is the absence of intimate male-female friendships which leaves one more open to sexual sin, not the presence of them. This is a book for singles and married people of all ages who want to learn more about the male-female relationships we are called to walk in as part of the family of God. Jones deals directly with questions such as: How close can men and women who aren't married get? Can there be real friendship? Is one bound to fall for the other? Will married people land in "emotional adultery"? The book ends with an eschatology of friendship, giving us a glimpse of what it will be like to relate to one another in Eternity. Joshua D. Jones is a writer, poet and Christian speaker and coffee snob based in Nottingham, UK. He was previously the Student and Youth Leader at St. Nic’s church, Nottingham before beginning his full time work speaking and leading in the areas of Christian Discipleship, Gospel Outreach and World Mission. He loves books, missions, good preaching, his family, coffee houses, music and friendship. He was born in the USA, married his lovely Scandinavian wife and they have four kids who were born in France and the UK.